The trip cost us $85, and we were lucky, others on our boat later told us what they had paid anything from $80 to $160 each for exactly the same experience. What appears to happen, to my sceptical mind, is that the tour guide from the hotel is actually an agent from one of these travel cafes. He arrives with busload of suckers, all who have been sold “luxury” cruises and generally up-sold as much as possible, and then goes into the dock office and passes you off into that system for a commission. Now you are in another system, which has bought you all at the same price. This is why paying more makes no difference to the client. To the agent, paying more goes straight into his pocket. So now, you are randomly’ishly assigned a boat by block and shuffled aboard. The boat crew have paid the office a small amount for membership of the boat club and they then earn all their money, beyond a cut of the price, in the reselling of extras. This explains why a beer is £4 and they hate you bringing your own water. However, that is just a theory and frankly like most we simply went along with it like sheep. After ten minutes our boat was ready. It didn’t look too bad; a little fake in that extra effort had been made to make it look oriental, with wood panels and dragonheads, etc. Really, it was just a big square-bottomed cruiser. We said hello to our fellow passengers and settled into our room. This was in the second deck above the main kitchen, which itself was above the engine. The quality of the room was not too bad for two days at sea and I am sure that in the summer a lot of fun is to be had in sunbathing on the decks. This was not summer, but then we are British and are more than used to that. Cesca showed concern about the noise, but I figured that we would be stopped during the night. 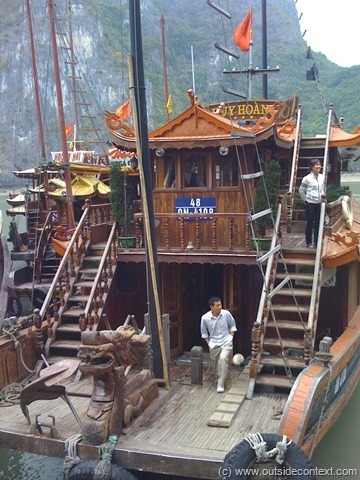 Of course, the boat and the rooms had only passing resemblance to the pictures in the brochures. The boat made its way out of the bay, jostling with the absolute armada of other semi-identical boats all setting off at the same time. We piled onto the top deck and considered the scrum; a veritable traffic jam of boats hitting each other and men shouting while wielding barge poles. All the boats had people on the top deck (effectively the roof) by now and everyone was a little sheepishly staring at each other’s transport to see who’s was the best. I think that ours was average. I was filming this amazing sight on my camcorder when it suddenly went pop and broke. Yep, I went off-line with my filming from this moment. This was the start of a big hassle and I did not get a working video camera up and running until half way through India, two months away! 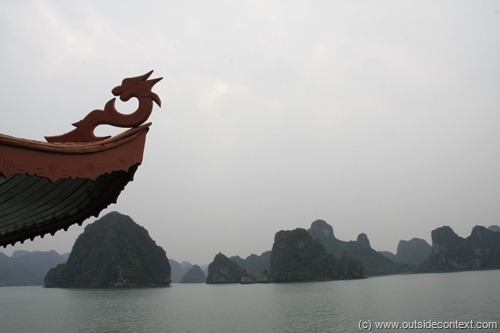 Anyway, we chugged across to the famous limestone karsts peaks of Halong. They were large, strange, and popping out of the water to great heights. Over all there are more than 775 dotted around only 334km. What I personally enjoyed more, strange old me, was the communities that live on the water, literally on the water, at the bases of the islands. Floating little villages and boats ferrying locals to a fro were very interesting. What would living in such a place be like? I wondered to myself. How would you get to work or to school? The boat made its way further amongst the islands, roughly in a line with all the others. Then we came to the first stop; the Sung Sot Caves, or in English, “The Caves of Surprises!” I have been in caves all over the world, from Asia, to America to Australasia and of course, in the UK, but here was a cave system of magnificent proportions. The Vietnamese know this and have designed a walk through the cave system that would be in Disney World if it were not so real. Well lit and stunning in proportion we went down to the caves in groups. The group leader tried valiantly to tell us about what we were seeing, albeit an official version, but I could not understand a word of what he was talking about so I started listening to the next group. Then I noticed my American chums from Sothern Vietnam. After exchanging hellos and a quick update on our journey through the county, Cesca and I joined in with them and we all walked around together. The girl, and I honestly cannot remember her name – sorry, was about to finish her 6 month trip and head back home. This was the first time that I had come across a now very familiar syndrome. When people start travelling they expect something to happen. They expect to change, get religion, or become one with nature. To find themselves changed inside, with the flashing of epiphany and momentous re-understandings of spacetime. It is not their fault; this is how travelling is sold to people; its image. Watching films like, The Beach or The Motorcycle Diaries, suggests that you can lose yourself and find yourself on your travels. Perhaps even become a famous revolutionary leader! The truth is not so seductive. Since then, I have come across this mind-set many times and I have talked many people through it, lent an ear and spoken a little on the subject. In fact, I have been thinking about it deeply and I am going to write a lot more than is appropriate here. Suffice to say, this girl was ever so slightly disappointed with her trip and needed to talk about it. I am glad that she chose me for that brief moment for I was able to tell her this: “When you get home, when you find your old life envelope you like a warm bath, you will feel a tinge of guilt. Guilt that you did not become Che Guevara or a Zen Buddhist Master. You may also feel shame. Shame that there is not a book going to be written about your experiences. You want your life to have a meaning; you are told that it is special. Of course, life itself is special, but the meaning of an individual’s life is not found at the end of journeys. Meaning is found by living and breathing. Life is not a pilgrimage with a reward at the end. Life is a dance, and one that you only get to dance once. Cherish what you have done, not what you missed. Don’t look back, don’t look forwards. Concentrate on now. Live in the now and let the past rest and future be. Then your life will not lack for meaning. 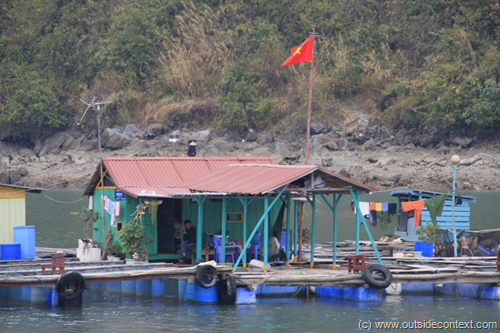 Anyway, out of the caves, we returned to the boat and it took us to a floating village. 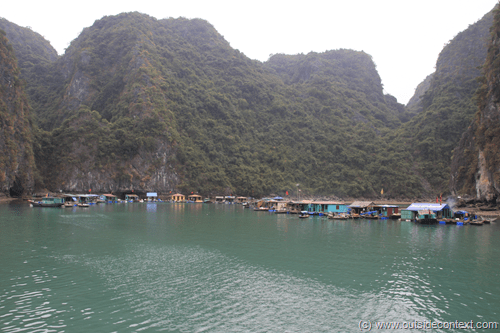 This village had some very dodgy canoes, which we all jumped in and rowed ourselves around and through a cave system. This was pretty cool, but let down by the very poor equipment and the short time given to this part of the journey. I got the sense of boxes being ticked by the tour guides. 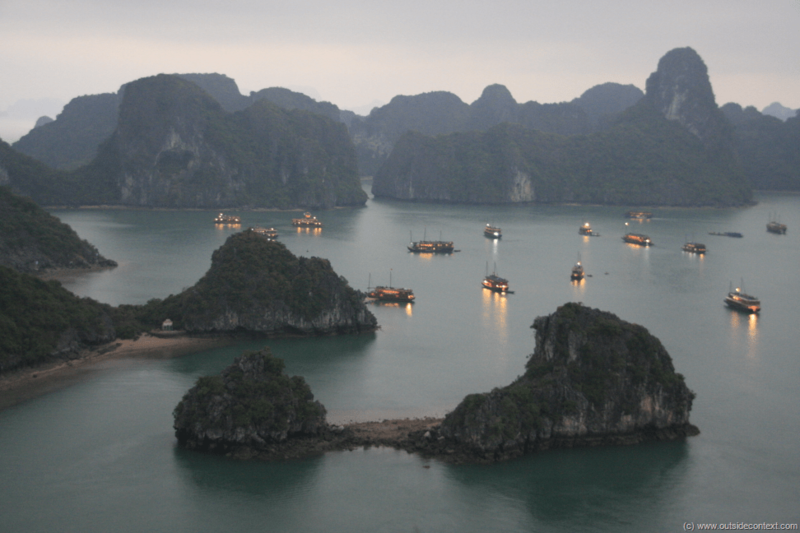 Then we were dropped off at an island to walk to the top of a karst mountain. It was great fun, if a little steep. At the top, we watched the nightfall and the lights come on all around. That night we came down for dinner and sat with a nice English couple we had been chatting to and getting on well with. Then the staff came up and directed us to move to sit with a different group. “Move that table now,” he said pointing to the table next to us. This conversation was then repeated with the next table and so on until the entire boat was being rearranged because no-one was seated “where they should be” Everyone had to get up, move a few feet and back sit down. People were all a little miffed to say the least and some loud protests fell on deaf ears. After all that, the only difference in the meal was the starter: crab. The Vietnamese insistence in this regard, and their total bemusement regarding our reticence, was the first time I had come across a peculiar Asian phenomenon. It does not happen very often, but mores and social norms are naturally different over here. Not that they are in any way wrong, just different and when Western and Eastern feelings clash it often results in a complete lack of understanding. Our hosts simply stood bemused at everyone’s problem with moving, shocked (probably) at the (apparent) rudeness. For the Westerners, on the other hand, who had all been brought up that the “customer is always right”, rules in restaurants are really only guidelines; often broken as a way of making one feel special. To us the staff were being amazingly fussy and rude. Who hasn’t been asked to follow a rule by a server of some type and then had them make an exception, “just for you sir”? We all have, it is common in the west. A Western server would not have insisted on a shuffle, they would have simply served where we were. It really was not important that we got the “right” meal, but it was important that we sat with who we wanted to. None of this exists in Asia and I had similar things happen in countries all over this continent. Especially Japan, where the normally super-polite Japanese can turn into being, what can only be described as, “bloody insistent.” I suspect the core of it is the language barrier, as English has all sorts of nuances and “ways of putting things” when speaking to soften an order into a request. To those coming to English from another language, having been taught direct speaking, they can appear rude as all hell. 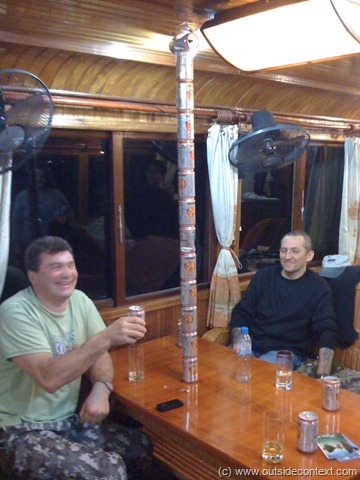 Once we had all had about six beers in us, the staff started the hard-sell on things like pearls. They did not get very far, but Cesca did buy some postcards. I suspect that the staff on these boats hate the rich westerners with their drinking, loud aggressiveness (to us: assertiveness) and incredible rudeness (what the westerners call ‘being direct’ or ‘plain spoken’). On the other hand, westerners probably just want an authentic experience without being asked to dip into their pockets every five seconds or the feeling that they are being fleeced. I think that trips like these made Cesca and I want to drop off the tourist routes as much as possible. To break out of that bubble and into a little freedom and honesty, where “tourists” were only normal “customers” and “servers” became “locals”. Such wants started to pull at us and our future plans for India started to take shape. Anyway, after enough drinking, Cesca and I left the others to it and turned in. The boat was anchored in a peaceful lagoon along with many others and it slowly drifted around the anchor. Cesca and I opened the windows to watch the lights of the other boats playing against the deep darkness. The sky was clear and in the distance loomed the shapes of the giant karsts.